A fabulous alternative to pins. A fun assortment of colors for an unlimited assortment of uses. Since their introduction primarily for seam binding on quilts, they have also been adopted by crafters, beaders, scrapbookers, card makers and every craft where a third hand is needed to hold something down, together or in place. Wonder Clips make a great and thoughtful gift for any crafter or home sewer. 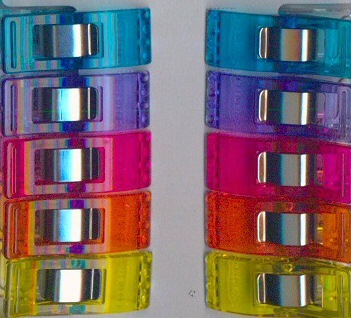 Wonder Clips may quite possibly be the most versatile and useful sewing tool ever devised. For years sewers have used binder clips, hair pins or even clothes pins for any number of sewing applications where an alternative to pins is desired. The Wonder Clip, designed and manufactured by Clover, is the first clip developed specifically for the needs of today's sewers, quilters, crafters and beaders. What else do these Wonder Clips Do? - We are still counting the uses! just loved the colors. They are very handy for keeping rows of the quilt together, and in holding things you can't put pins in. Vinyl, thicker fabric/interfacing when making pouches and or purses.